Be it at the beach or in the backyard, Australians love to kick off spring and summer wearing an apron and wielding tongs while gathered around a grill. This year, as the mercury rises, why not challenge yourself to go beyond the usual snags on bread? 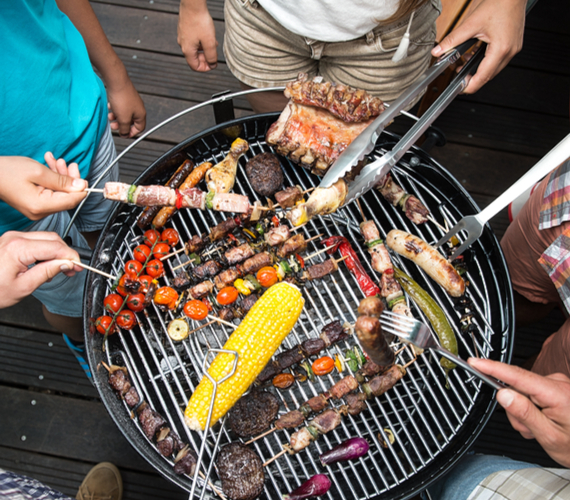 Whether you’re cooking over a traditional campfire, on a charcoal Weber or gleaming seven-burner gas barbecue, here's how to reinvent your barbecue dinners with ease. It doesn’t take much effort to make food fragrant with spices and herbs. Salt seasoned with coriander, cumin, cloves and ginger works well on a beautiful piece of steak, while a mash-up of garlic, rosemary, salt and lemon zest takes lamb to the next level. Tip: remember to bring meat to room temperature before you pop it on the hot plate. Chicken is always a popular choice when skewering meat, especially when marinated in a tangy-sweet mix of soy sauce, honey, turmeric and garlic, then slathered with a coconut satay sauce. Prawns rubbed in a little salt and a touch of olive oil, then threaded individually on skewers are also popular as party starters. 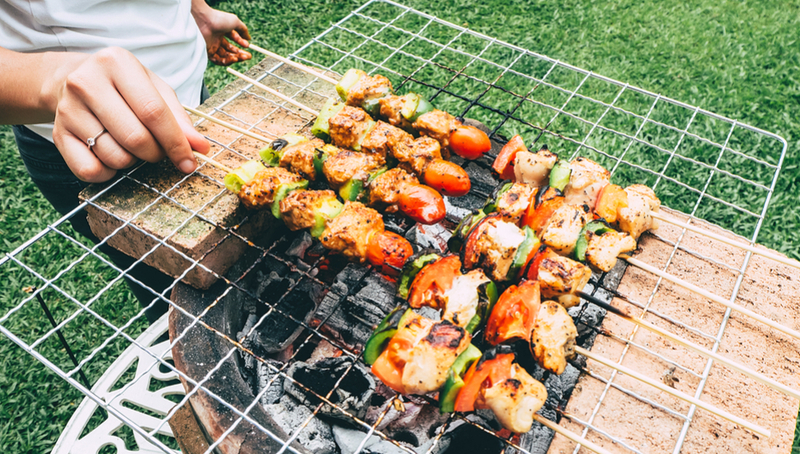 Tip: soak wooden skewers before use or pick up a set of reusable metal ones. It's not just carnivores that get a thrill at the grill. Corn with peri-peri butter is a perennial favourite, as are meaty mushroom steaks, coconut and lime tofu cooked on skewers of lemongrass or chunks of haloumi, grilled until golden. Other vegies made great when cooked on the grill include eggplant, capsicum and zucchini. Tip: oil the vegetables before charring on the outside, then cook over a cooler part of the barbecue. As the mercury rises, why not challenge yourself to go beyond the usual snags on bread? Depending on how much heat you can handle, you can whip up a dry rub to suit. If you want to go for South-East Asian flavours, try marinating meat with a blend of chillies, lemongrass, fish sauce and galangal. Fans of Jamaican jerk chicken should know that the secret to the seasoning is largely due to the addition of Scotch bonnet chillies, which really pack a punch. Tip: you can make jerk chicken with a wet or dry rub. The dry rub is crispier; the wet rub makes the meat juicier. Grilling a whole fish rather than fillets isa great way to go. The bones help keep the fish moist on the grill and also add a great depth of flavour. Season the fish inside and out, and make sure the barbecue is hot so the skin takes on a real char. For a Thai take, pulse a mix of green onions, lime juice, coconut oil, lemongrass and mint leaves, chilli, garlic and coconut milk in a food processor until a coarse paste forms, then use a marinade. 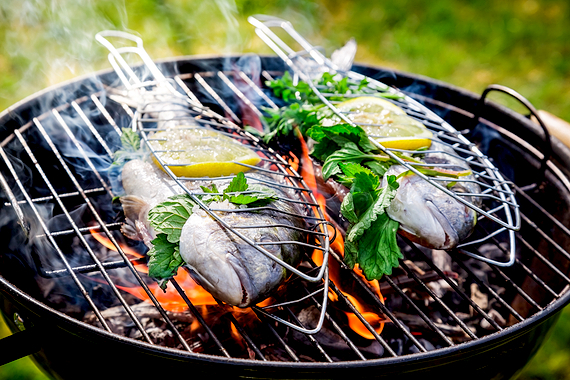 Place the fish on the barbecue and grill until the skin blisters. Cook for two to three minutes on each side or until the skin is caramelised, golden and crispy. Tip: invest in a grill basket to help keep the fish from breaking apart.